National Parks and Forest Parks surround Tapawera. Abel Tasman National Park, Kahurangi National Park, Mount Richmond Forest Park and other forest reserves around the Tasman region and heritage sites such as Spooners Tunnel, Wadsworth Motors, old regional schools, Golden Downs Golf Club, the forestry camp and many other sites. 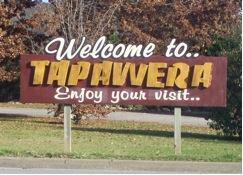 Tapawera, from the Maori 'Tapa' (forest edge) and 'wera' (hot/burnt) is a relatively small town in rural Tasman district with a population of approximately 600 in the town and surrounding area. It is located about 40 kms southwest of Nelson in the beautiful Motueka Valley, approximately 8 kms north of the SH6 Kohatu Junction. The town centre has an information centre, museum, church, area school, supermarket, NZ Post, campground, fuel and auto-repair, hotel/pub/restaurant, cafe/takeaway and supplies shop. 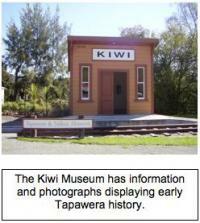 There are also many other clubs/organizations and businesses in and around the broader Tapawera district. 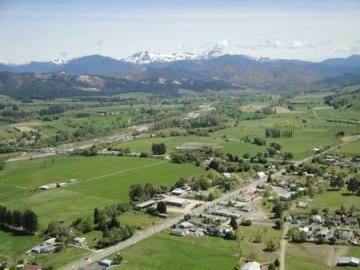 It was first established as a gold mining village base.